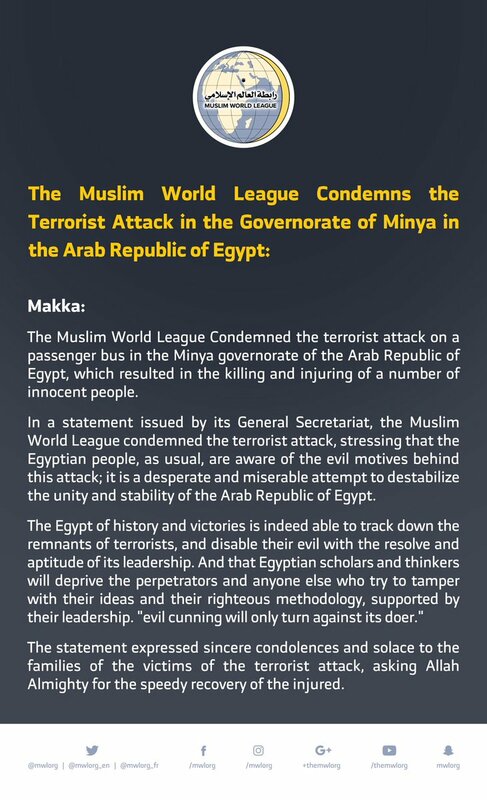 The Muslim World League Condemned the terrorist attack on a passenger bus in the Minya governorate of the Arab Republic of Egypt, which resulted in the killing and injuring of a number of innocent people. In a statement issued by its General Secretariat, the Muslim World League condemned the terrorist attack, stressing that the Egyptian people, as usual, are aware of the evil motives behind this attack; it is a desperate and miserable attempt to destabilize the unity and stability of the Arab Republic of Egypt. The Egypt of history and victories is indeed able to track down the remnants of terrorists, and disable their evil with the resolve and aptitude of its leadership. And that Egyptian scholars and thinkers will deprive the perpetrators and anyone else who try to tamper with their ideas and their righteous methodology, supported by their leadership. "evil cunning will only turn against its doer." The statement expressed sincere condolences and solace to the families of the victims of the terrorist attack, asking Allah Almighty for the speedy recovery of the injured.